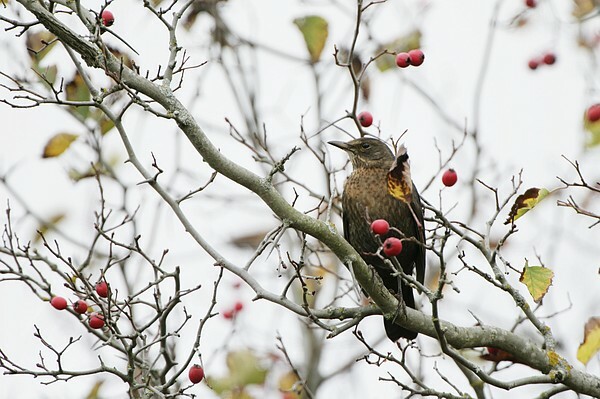 The major migration of passing blackbirds this autumn is still about to come. The long and very warm autumn has kept passerines stationary. Usually the migration towards south is at the end of November or December. This time let us begin the presentation in reverser order to the usual, first introducing the female bird. 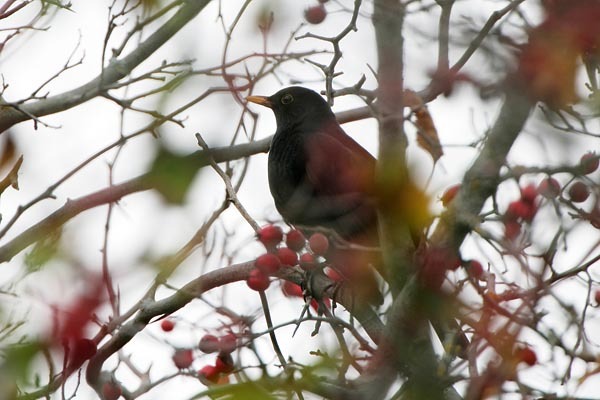 Nearly every year photos of female blackbirds are sent to us in winter, with the question: who is this? The back plumage of the female bird is dark brown on top, on the underparts somewhat dully dotted-streaked, the beak dark brown or a little yellowish. The young birds resemble the females, the belly is streaked in yellowish-brown, the back brown with paler flecks. The male bird wears a black suit, without any metallic sheen, throughout the year; only the beak and the circle around the eye are yellow. On the ground the birds often raise and dip their long tail and move around in jumps – there is always something to be found on the ground and in the leaves. On the autumn-winter menu are berries, seeds and also apples left on the trees. Up to ten thousand birds may stay in Estonia to winter, depending on the severity of the winter. Mostly we meet then on the western islands or near the coast in garden cities, hamlets, villages.